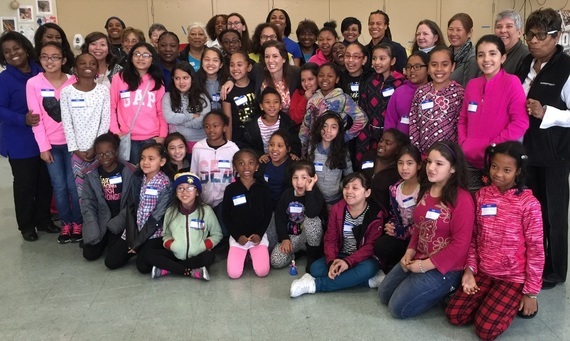 In 2016, we led a day-long workshop for more 40 girls that featured Oakland Mayor Libby Schaaf along with Oakland women firefighters, doctors, astronomers, teachers, administrators, construction professionals, dentists and many more. And, of course, we took the girls shopping for new shoes so they could continue their "Steps to Success." At the 2018 event, the girls heard from a the Superintendent of Oakland Public Schools, a carpenter, a civil engineer, a soccer coach, firefighters, a cosmetologist, and police officers and crime evidence technicians. Thanks to our partner, Payless Shoes, and all the volunteers that have supported this project through the years. Contact us if you're interested in helping support the Shoe Project - or make a gift to support the girls' "Steps to Success." Click here to see our 2018 Shoe Project video!